Whether it's a sound bar or an elaborate surround sound setup, a lot of people's best speakers are attached to their TVs. A lot of people also have Amazon Music, whether or not they realize it; the service comes free with Amazon Prime. Owners of Android TV hardware will soon be able to use those speakers to listen to that music, as a Play Store listing for a TV version of Amazon Music has appeared. The app isn't available yet, but if you're champing at the bit for it, you can pre-register to get it as soon as possible. Amazon Music has more than two million songs for your listening pleasure, according to the listing, and the TV interface doesn't look too bad, either. If you're not already committed to another big-screen music streaming service, you can head over to the Play Store to pre-register for the Android TV Amazon Music app now. So, remember how we were all excited about the arrival of an Amazon Music app for Android TV devices at large? That's very much what looked like was happening, but today we got what's potentially some bad news for Android TV users — unless you happen to be using just the right device. NVIDIA just released its Shield Experience 7.2 update for Shield TV boxes, delivering Amazon Music integration among a host of other feature tweaks and bugfixes. 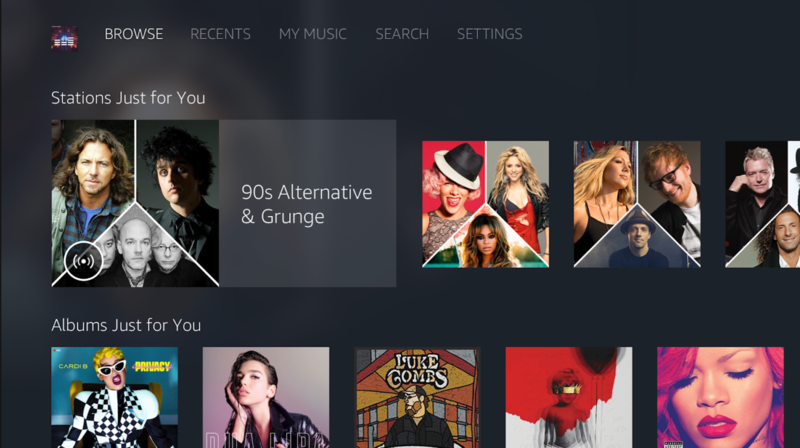 But in the process of this update rolling out, we saw what was formally "Amazon Music for Android TV" morph into "Amazon Music for NVIDIA SHIELD." That's a big letdown for Amazon Music fans expecting an experience that would stretch across the Android TV ecosystem. We'll be keeping our eyes peeled in the hopes that one day a more broadly focused app like that lands.